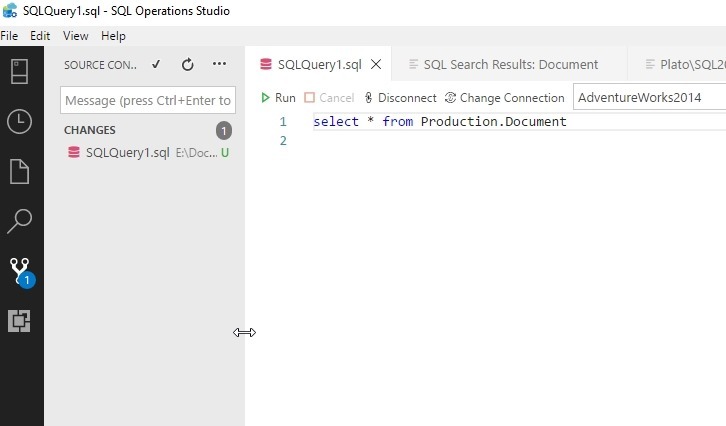 I’ve been starting to use SQL Operations Studio (SOS) a bit more. This is a small, lightweight editor that is based on Visual Studio Code. It’s fairly limited, though it’s still in preview. You can download it and give it a try. One of the things that I like is a consistent UI when writing code. I often hide the OE in SSMS, but I don’t want code moving left and right when I’m working with it. That can be a little jarring. When working in SOS, I usually start with a query, and no blades (panes?) open. My workspace looks like this. If I need to commit to version control, I’ll click that button, but then my code moves. (I’m really not committing this query. It’s just an example. The process is just a little distracting to me, especially if I make the pane wider to more easily see the Object Explorer or file list. I didn’t like this in Visual Studio Code when writing PoSh or Python, and I don’t like it here. Someone on Twitter posted a couple neat tricks, one of which was moving the panes to the right side. I know some panes in SOS, like the connection one, are always over there, but you can move the main panes. I’m surprised I didn’t see it, but I really never even thought about this being an option. I was just annoyed. If I’d looked in the View menu, I’d see “Move side bar right”. If I do that, I get this. The other cool trick doesn’t do much in SOS yet, but it works in Visual Studio Code. I’ll show it there. If I create a new file, VSCode doesn’t know what I’m doing. About half the time I’m writing Python, but I don’t get any of the intellisense or other features unless I save the file and give it a type. 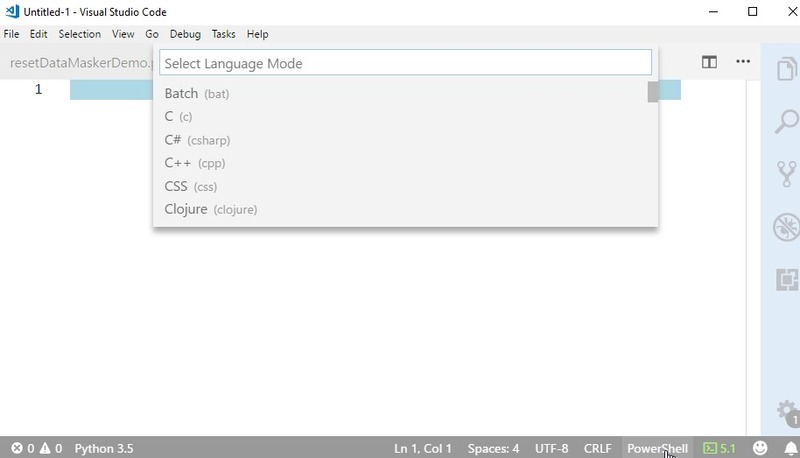 The other option, is to click the language name in the lower right corner. In the image, I’ve clicked the “PowerShell” and this opens a list of languages. Type “py” and get Python. Cool tricks. I expect that over time SOS will have more than just the “mssql” is has now. I’d expect MySQL, PL/SQL, and more. 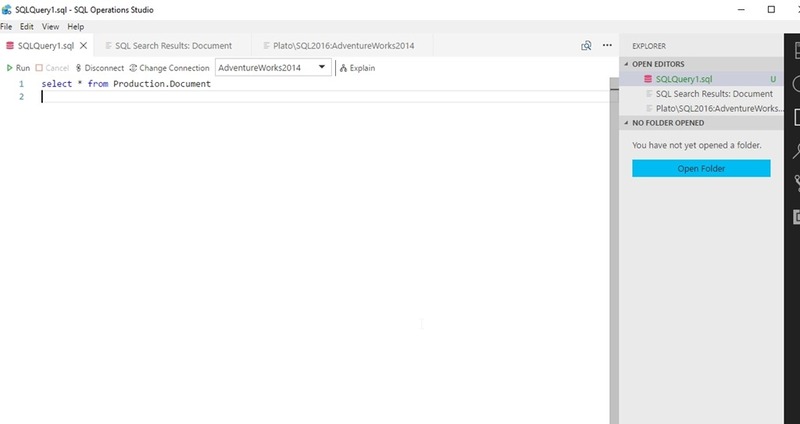 This entry was posted in Blog and tagged SQL Operations Studio, syndicated. Bookmark the permalink. LoL. that’s on my list as well. Or maybe scheduled already.